In the realm of online slots, finding fun pokies to play can be a tedious task. However, we have found some the most fun-filled slot games, each with their own unique characteristics from some of the leading online software developers to make it easier for online players. We recommend visiting our suggested Internet casinos to play the following games, as you will easily find the following titles and when playing with real money you will not be comprising your financial details due to the level of safety these recommended online casinos implement. When playing slots online you’ll come across games of all different varieties and themes, including Christmas themed pokies, Western themed pokies, fantasy themed slots, movie themed games and many more, so there’s always something available to suit all individual tastes and preferences. If you want a slot to get you in the mood to party this pokies machine is probably the loudest and and most flamboyant slot available by Net Entertainment. Only available at Leo Vegas Casino (which is unfortunately no longer available to Australian players), the game features iconic characters such as James Bond, the Joker and Cleopatra. Additionally, it has 243 ways to win, making it a definite crowd pleaser, along with a standard 5-reel format. With 270,000 coins up for grabs in the jackpot, it is definitely a Vegas style party. But the most fun thing about this slot is the linked reels feature. Each spin begins with linked reels and they can potentially link more reels to join together three, four, or five of the reels. This can be triggered on any spin at random and can actually multiply wins by five on just one spin. From 25 cents right up to $125 per spin, this is suited to a broad budget and there are quite a lot of coins to be won, though there aren’t any free spins. Vegas Party can be played on any platform you prefer, whether it be a smartphone, tablet, laptop or desktop. 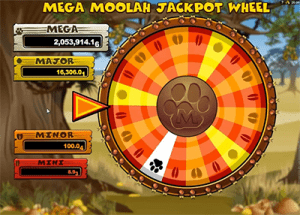 Mega Moolah is Microgaming’s infamous progressive jackpot pokies which has made many players millionaires in the past. This African themed progressive is quite popular in the realm of online slots and for good reason. Besides the mega jackpot, which reaches seven figures regularly due to a little bit of every player’s bet contributing to the prize pool, there are three smaller jackpots including the mini, the minor, and the major, available to win, giving players more chances to win quite a generous sum of money. With 25 paylines and a 5-reel format, the game is like a standard Internet video slot, except you need to be playing the right amount in order to potentially win the jackpot. 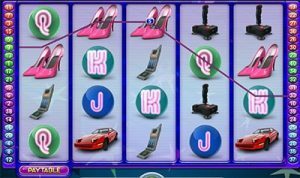 There isn’t a trick to winning the jackpot and this can be played on any platform, so if you login to an online casino and pick this title via your smartphone or tablet you can play this progressive, which is linked around the globe, on your mobile device. One man won $3.7 million via his smartphone on Mega Moolah, proving it is quite possible to win on any platform. With buffalos, lions, monkeys, giraffes, zebras, and more, it is hard not to have fun with this progressive which features a payout of 94%-95%, similar to that of all Microgaming slots. For those who remember or were born in the 80’s know just how fun the decade was. This Net Entertainment slot takes inspiration from the pop culture era, with walkmans, joysticks, skateboards, and more, getting us all nostalgic. Super Eighties is a 5-reel, 40 payline slot with an 80s soundtrack (which can be a hit or miss) we personally find it a good accompaniment to the theme. There are free spins on this one of up to five and a 2x multiplier too. Five free spins seems pretty dismal but during the free spins players have the opportunity to win more free spins. Featuring a 96.50% payout rate with the minimum spin of just one cent, it is a fun option for beginners. The jackpot is 40,000 coins but that is only if the symbols are stacked and fill all the reels, with just five jackpot symbols on one payline seeing 1000 coins won. The scatter symbol is the woman and the jackpot symbol is the 80’s wild symbol. While there isn’t a bonus round, the free spins which can be re-triggered randomly and quite consistently does make do for this gap. Overall this slot isn’t a great one for players after something serious with a massive jackpot, but the theme is incredibly fun and there are free spins to be won. You can find this slot machine at any Net Entertainment online casino we recommend. Well first up, how fun is the name pun? This is a Microgaming, 243 Ways slot which must have slipped through the reels in terms of popularity (see what we did there?). 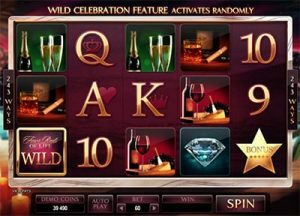 Featuring all the finer things in life such as expensive champagne, delicious cheese, coffee and chocolate, and even diamonds, but the best part about this slot is there is an $18,000 jackpot available if you land the Wild Celebration feature which can be triggered randomly during gameplay. Champagne bottles will appear and corks will start popping. With every cork that does pop, players get one reel filled with wilds. Get all five wild reels with the maximum bet in place and you can win the jackpot. For those who luck out on the celebrations there are still some good wins in place, including free spins, and multipliers. The coffee and chocolate symbol means you have landed 10 free spins with a 5x multiplier; the wine and cheese symbol means yo’ve scored 15 free spins and the potential to get 14 wilds with the feature game; the whisky and cigar symbol lands you 20 free spins with multipliers of 2x, 3x, or 6x; and finally the champagne and diamonds symbol which sees 25 free spins and a rolling reels feature which is in many Microgaming games and means you can score lots of wins with stacks of wilds. Find this slot at any of our recommended Microgaming online casinos. Play these five fun pokies and 1600+ other slot games with no downloads required at Slots Million, where eligible new players can claim up to $100 in bonus money and 100 bonus spins.